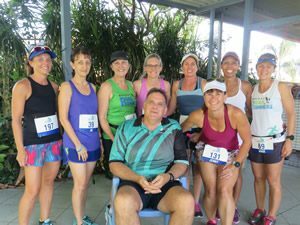 Over seventy runners converged on the usually quiet Sunday afternoon West Mackay streets for the annual Mackay Road Runners Tilse Toddle 5 & 10km event which was the second race on the official 2018 program. The oppressive weather did not deter runners, however, participants took into account the steamy humidity and sensibly adjusted their running capabilities to suit the conditions. Club President, Tim Magoffin and Race Hosts, Paul & Janelle Tilse welcomed the spectacularly keen crowd before advising the latest Club news, notices, important upcoming events and course briefing. The course, which took runners South along the awesome City trails towards Archibald Street, consisted of two loops for the 10km and one for the 5km. Julian Picot had an outstanding 10km run considering his very successful international race in a personal best time at the previous weekend’s 42.2km Marathon in Iwaki, Japan. Second placed Jared Spence was a further six minutes in deficit with Andy List less than one minute later for third. First female and eleventh overall, Carmel Mahon clocked forty-eight minutes 29 seconds ahead of second female and twelfth over, Jose Short (49:39). Jo Skinner also showed blistering pace to collect third place ahead of fast finishing Karla Hook, Vicki Vickers, Kylie Harbour, Judy Zahn, Ainslie Heinke, Lauren Dunne and Anna Walsh rounding out the top ten female finishers. Excellent 10km performances also came from Greame Harris, Leon Ryan, Craig McGahey, Matt Graves, Lindsey Wiggins, Ricky Parker, Tim Caddy, Scott McIntosh, Ross Vickers, Mark Walz, Stuart Sprott, Martin Lambert and Mark Takagaki. Congratulations to Scott and Dale McIntosh on the arrival of their beautiful new baby boy, James. The five kilometre event was a hotly contested affair with Will Morgan literally scorching over the course in eighteen minutes 36 seconds ahead of first female Ashlee Scott (21:16) and Paul Arvidson (22:25) with Shelley Binney charging home only four seconds later. Peter Ford (23:36) had a great run followed in quick succession by Carolyn Steginga (23:45), Mark Pashalis (23:49) and Bianca Miles (24:11). Josh Eisemann made a welcome and long awaited return to the Mackay Road Running scene after a well-earned break from his Las Vegas Marathon last November. Josh’s injury woes held him back significantly in the 33,000 plus competitors in Vegas, however, Josh was not deterred, still completing the 42.2km and having a great time before, during and afterwards. Great running in the 5km also came from Layla Sanders, Jo Hughes, Kim Saron, Cilla Martland, Joanne Ashford, Jenny Smith, Geoff Neale, Bernadine McKinnon, June Bradley, Andrew Short, Daniel Stampa, Belinda Van Lint, Sandy Marchetti, Finn Zamparutti, Simba Walz, Darrin Pullen, Rodney Yates and Julie Whibley. Many thanks to the awesome race day volunteers – very efficient timekeepers with results published within a few hours on the website (Brendan Bishop and Peter Wight), water station attendants (Ross Connor & Leanne Connor’s awesome coconut crumble sweets), course and race setup (Andrew Short & Tim Magoffin) and registrar (Paul Tilse). Please thank them and all Club volunteers as there would not be a club or events without them. Runners were also treated to post race treats, generously supplied by Jo Hughes, Leanne Connor, Sandy Marchetti and Paul Tilse. Thank you also to the understanding residents of Johnson Street for the couple of hours of minor traffic disruption. 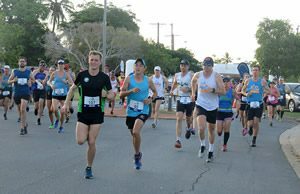 This Sunday’s Martel Marina Sprint 5/10km event will commence from the Mackay Harbour’s Old Mulherin Park precincts starting at 5.30pm. The course will be a two loop course, taking runners onto the Breakwater and return. Members are to ensure they wear their race number and timing chip and also arrive at least 15/20 minutes prior to gun time. This will allow you to register with the timekeepers, warmup for your event and listen to the course description from the Race Director. This also allows the volunteers to warm up prior to their event. The Club also asks you to consider what you can do for your Club, all assistance greatly appreciated. 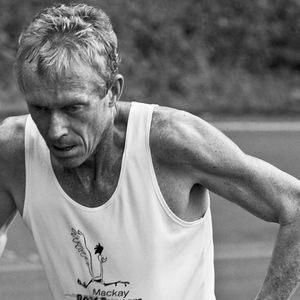 Visit mackayroadrunners.com.au for upcoming events including the BMA Mackay Marina Run Launch 5km run, Friday 6pm from the City Cinema carpark, Gordon Street…..all proceeds to go to the BMA Mackay Marina Run’s charity – The Leukaemia Foundation. The general public, Club Members, their family and friends are invited to participate by walking or running this event and attending any of the club’s events.